Madhavi Mavani Assistant Professor, Department of Anaesthesiology, GMERS Medical College & Civil Hospital, Sola, Ahmedabad, Gujarat, India. Ila Patel Professor, Department of Anaesthesiology, GMERS Medical College & Civil Hospital, Sola, Ahmedabad, Gujarat, India. Background: Pain is one of the most compelling experience for human beings. Pain is the most difficult one to define and assess, as it is a purely subjective sensation experienced only by the sufferer. Present study was done in which Buprenorphine was given epidurally along with Bupivacaine and Xylocaine as a single shot technique to evaluate its potency, duration of analgesia and other side effects. 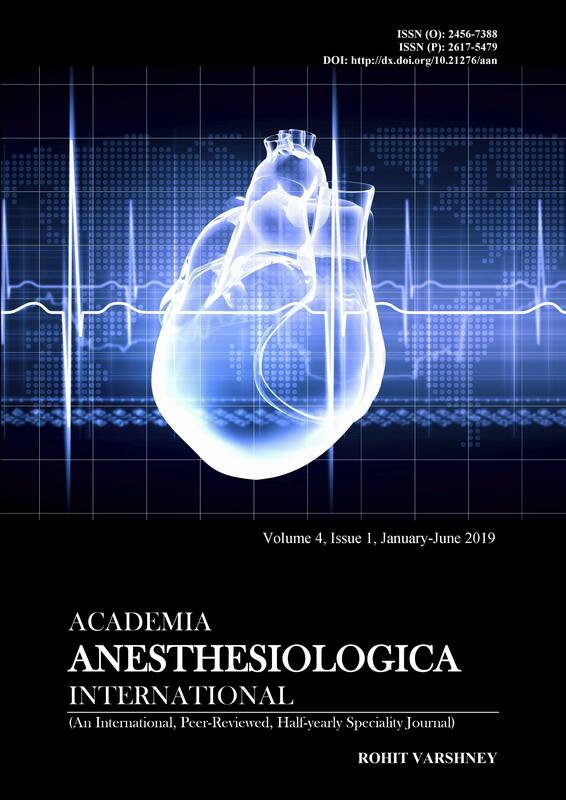 Subjects and Methods: Fifty adult patients of ASA risk I/II undergoing lower abdominal surgery, lower limb - orthopaedic surgery, surgery involving perineal region and gynaecological procedures were selected for our study. The patients were divided into two groups consisting of 25 patients each. In group I, patients were given Inj. Bupivacaine 0.5% 20 cc + xylacaine in lumbar epidural space. In group II, patients were given Bupivacaine 0.5% 20 cc + xylacaine 0.5% 20 cc mixed with Inj. Buprenorphine 0.2 mg (2 ml) in same syringe in lumbar epidural space. Duration of total analgesia was measured with help of pain scorre, which were measured throughout operative period and in postoperative period. All the statistical tests will be performed in SPSS version 15 software. Results: In study group majority patients complain of pain at around 16 to 20 hours. Most of the patients in group-I are in 0-4 hours and in group – II are 20-24 hours. Maximum respiratory depression was around 12% (2/min). It was observed that hypotension was seen in 4 cases and bradycardia in 4 cases – intraoperatively and postoperatively no patient had bradycardia or hypotension in study group. Conclusion: Buprenorphine if given epidurally along with local anesthetic solution for various surgical procedures can provide excellent pain free period lasting up to 24 hours without any disturbances to normal physiology life and notable side effects.